Last year, M unchkin and Pomeroy found their perfect summer Rose' at Chester Gap. 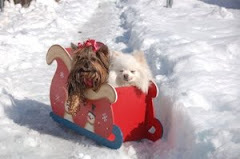 So as they prepared for their annual beach jaunt, they dropped in to resupply. 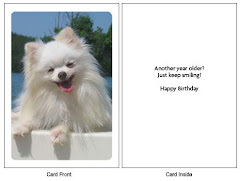 Doggoneit! Berndt did not make a 2008 Rose (and the 2007 was long gone). 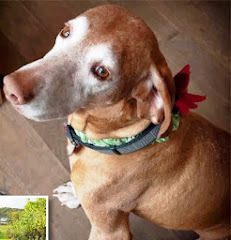 Never ones to waste a perfectly good winery visit, the Wine Dogs picked up a couple of bottles of Merlot and enjoyed a lovely bottle of Chester Gap Viognier while taking in the outstanding view of lush vines from Berndt's deck. It proved to be a serandipitous choice. 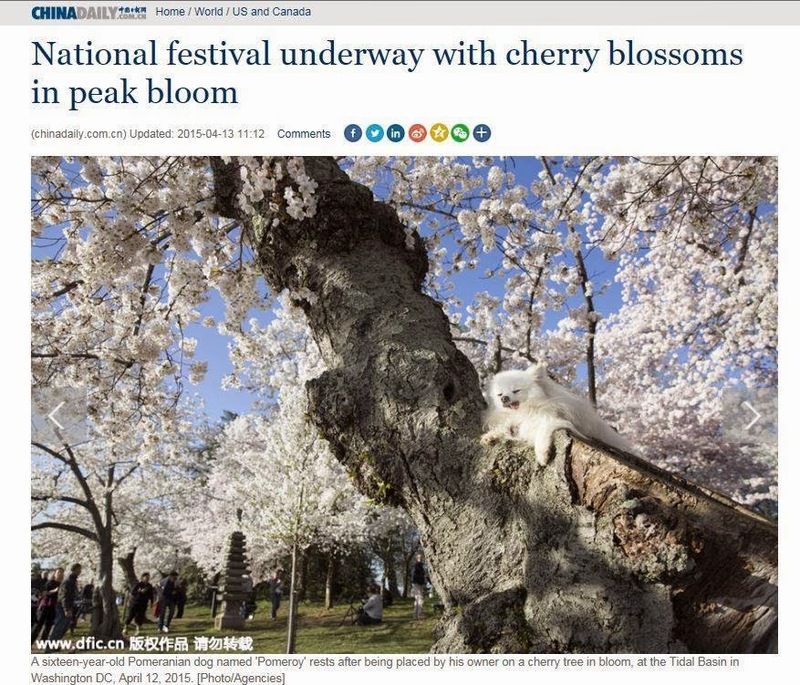 While the pups were drowning their disappointment, Munchkin pawed through a magazine and discovered an oh-so-timely feature on Virginia's best Roses. 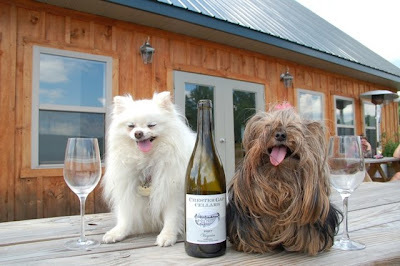 Excitedly, she told Pomeroy a trip to the new winery at Glen Manor Vineyards was in their future. The next challenge was squeezing the visit into their busy schedule. 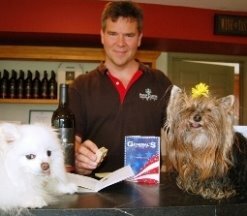 Owner Jeff White came to the rescue by opening up an hour early on Sunday for the Wine Dogs. 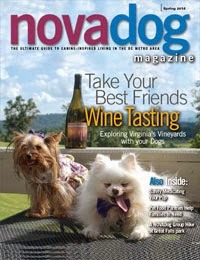 Jeff ushered the Wine Dogs into a clean and sleek tasting room, featuring blond wood, leather chairs, and oriental rugs. Following close behind was leading Virginia Tech viticulturalist Dr. Tony Wolf, a consultant and fan of the new winery, bringing friends from the 'Burgh. 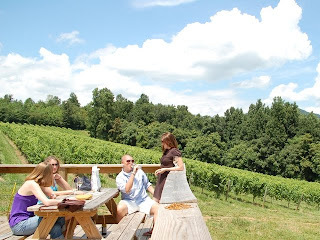 Warren County's first winery opened last April on a 226-acre farm in a glen ringed by Skyline Drive (for the best view, check out Gooney Manor Overlook). 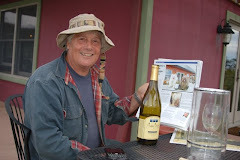 The farm has been in White's family for more than a century, but it wasn't until 1995 that Jeff , who was working for Jim Law at Linden, planted his first vines. Today, Glen Manor has 14-1/2 acres in grapes. The more recently planted, mostly red Bordeaux vines (2008-09), are on much steeper slopes than the earlier vines. Jeff currently produces 1,200 cases of wine a year, with plans to expand to between 3,000 and 4,ooo cases. The oldest vines are the Sauvignon Blanc grapes. 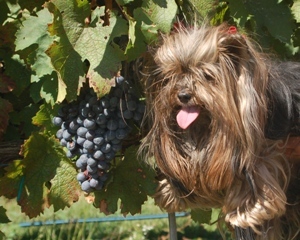 The Wine Dogs tasted both the 2007 and 2008 vintages. The former is Sancerre style, with great legs and a mineral taste. "This wine is all about the texture and weight," White explained. In contrast, the New Zealand style 2008 is a lighter, fruitier, flowery wine. He must have recalled the Wine Dogs were shopping for the beach, because he told them to think Buffet and the Beach Boys. 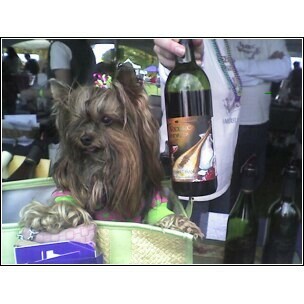 Yum-yum, said Munchkin as she tasted the 2007 Cab Franc, aged in 50 percent new oak. The final wine was the 2007 Hodder Hill -- the name of the older vineyard. The Bordeaux blend was leggy with excellent balance and structure. 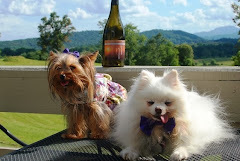 Oh, and the Rose'... Munchkin and Pomeroy took a six-pack home after taking in the view of Skyline Drive from the back deck. These are some great wines. Yes, they are a little steep in price. And currently they only have four of them. But this is a nice, tucked-away spot with a view of the mountains and Skyline Drive in the back. A good alternative if nearby Chester Gap or Rappahannock Cellars are too crowded.I like these wines with cigars, especially with Cuban Cigars.